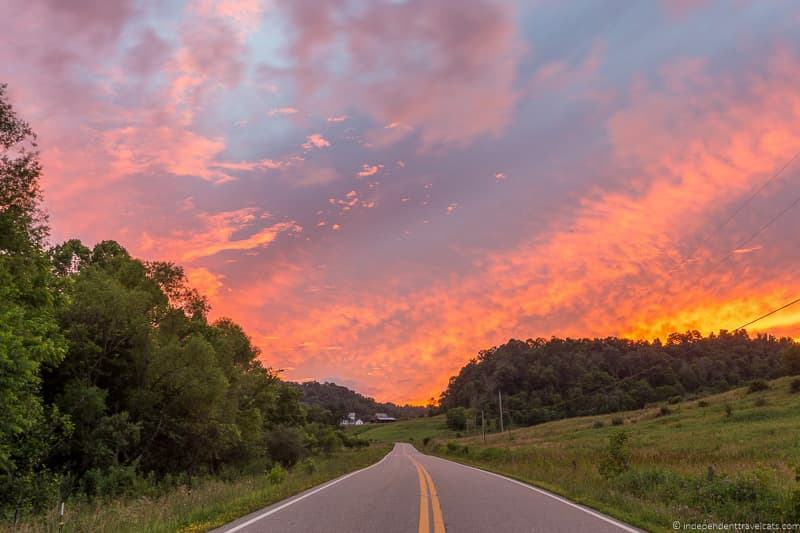 Caldwell, Ohio might not be a top travel destination, but there are plenty of reasons to make a stop in Noble Country Ohio and the town of Caldwell. 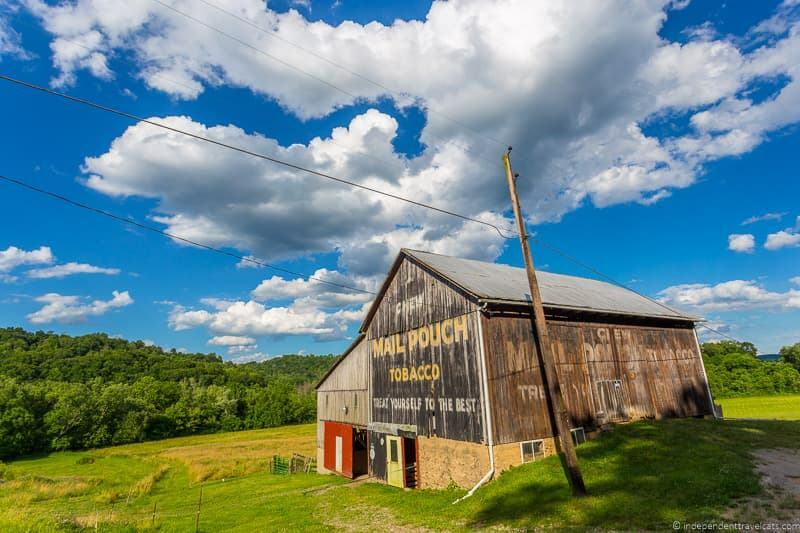 Noble County has a rich Appalachian history, beautiful countryside, and friendly people. It is a great place to experience a bit of small town America. Here you can learn about local history, see covered bridges, visit a state park, learn about the U.S.S. Shenandoah airship disaster, see North America’s first oil well, visit a glass museum, and much more! Outdoor activities include boating, hiking, fishing, and camping. 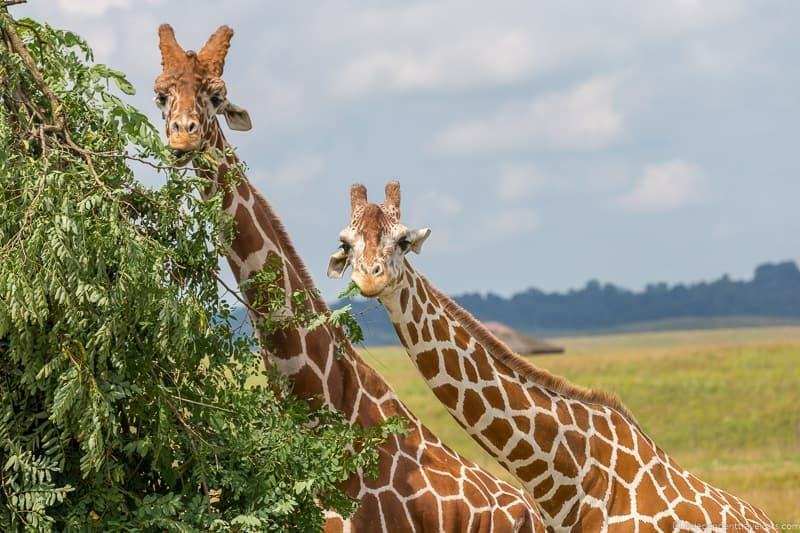 Nearby, there is also a huge safari park where you can see zebras, rhinos, and giraffes roaming the Appalachian foothills! I am a bit of an expert on Caldwell as I was born here and grew up here. It wasn’t until returning to my hometown as an adult that I was able to appreciate the things the area has to offer. This Noble County travel guide will tell you everything you need to know to visit the area, where to eat, where to stay, and things to do. Where is Noble County Ohio? How to get to Caldwell Ohio? Where to Eat in Noble County? 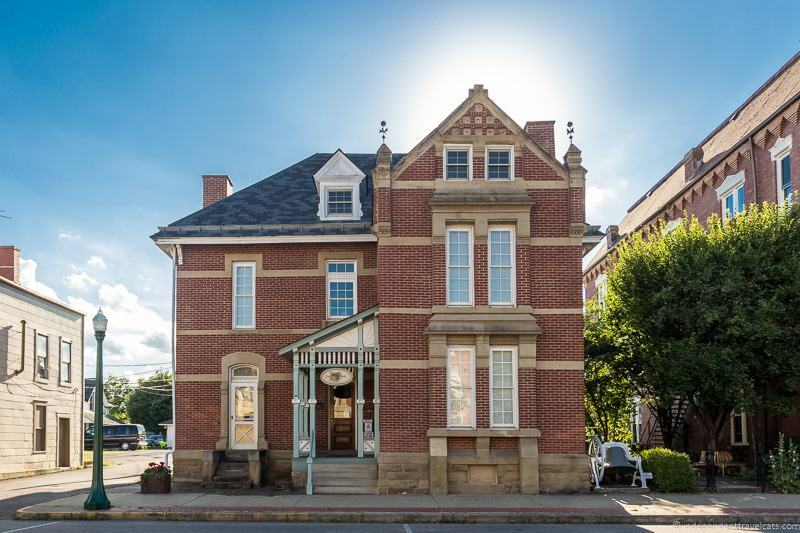 Where to Stay in Noble County? First, let’s talk details. 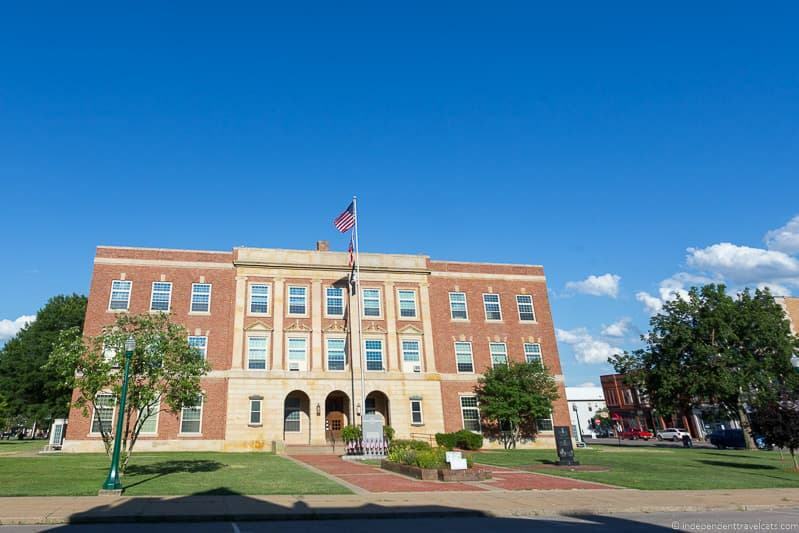 This section will brief you on where Noble County is, how to get here, and what you need to know before you go. Noble County is located in Southeastern Ohio, roughly halfway between Columbus, Ohio and Pittsburgh, Pennsylvania. Caldwell, the largest town, is located roughly in the center of the county, right off of Interstate 77. The best way to get to Caldwell is by car, but you can also take a Greyhound bus as well. There is no rail service in Caldwell, but if you are traveling by train you can take an Amtrak train to a city such as Cleveland, Pittsburgh, or Cincinnati and then take a Greyhound bus to Caldwell. Be sure to check schedules for both the train and bus before booking. Car is by far the easiest way to get to and around Caldwell. Caldwell is right off of Interstate Highway 77, about 24 miles south of Cambridge and 28 miles north of Marietta, Ohio. The nearest major city is Columbus Ohio, which is about 100 miles west. Cleveland is 140 miles to the north and Pittsburgh, Pennsylvania is 140 miles northeast. The Greyhound bus stops in Caldwell several times a day and runs a direct route to and from Cleveland. You can also get to or from Caldwell from many other cities, including Pittsburgh, Columbus, and Cincinnati, but will require making a transfer or two. Caldwell’s Greyhound stop is not a full service terminal, which means you cannot purchase tickets there. Tickets should be purchased online ahead of time, or at another full service terminal. The Greyhound stop in Caldwell is located within a 1 minute walk to the local McDonald’s and Noble County Fairgrounds. 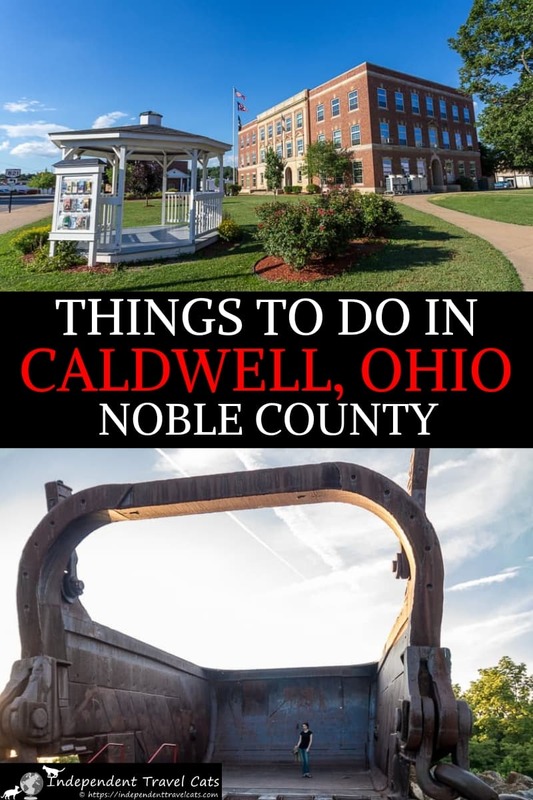 There is no regular public transportation service offered in Caldwell, so the only way to get around to all the sites in Noble County is with a car or bike. There is no place to rent a car or bike in town so if you need one, be sure to do that elsewhere. If you are coming to Caldwell for an event at the Noble County Fairgrounds (about a 1 minute walk from the Greyhound bus stop) or Downtown Caldwell (~ 20 minute walk) you can get around on foot. There are restaurants, fuel stations, and motels within walking distance. But if you want to see things outside of downtown Caldwell, you will really need a car. Southeastern Ohio’s weather is milder than northern Ohio. Winters can be cold with frequent snow, and summers highs are typically in the mid-80’s F.
The best time of year to visit is late spring through early fall so that you can take advantage of good weather and some of the fun seasonal events that occur during that time. For such a small county, there are several restaurants and all are pretty casual and most focus on homestyle cooking. Most are family-run small businesses. There are also a few fast food chains in Caldwell including McDonald’s, Subway and Domino’s Pizza, and there is also pizza, sandwiches, salads, and more available at the Pilot Travel Center. Lori’s Family Restaurant (17020 McConnellsville Road, Caldwell) – A family-friendly and family-run restaurant serving American classics, comfort food, and seasonal specialties. Offer daily specials. Local favorite since 1987. Save room for pie! Kathy’s Kitchen (426 Cumberland Street, Caldwell) – This casual eatery is located on the Main Square and serves burgers, meatloaf, mac and cheese and other comfort food. Daily lunch specials. Previously the location of the Sandwich Shoppe and Archwood Family Restaurant. Wally’s Pizza and Subs (805 Miller Street, Caldwell) – This local pizza spot makes old fashion subs and pizza with dough made in-house daily and fresh ingredients. You can order by phone or online. Local Roots (78 Olive Street, Caldwell) – Caldwell’s only independent coffee shop serving coffee, sandwiches, breakfast burritos, fresh smoothies, and baked goods. You can even order online for pick up. This is pretty much the only place in Caldwell you can get a green matcha tea latte, dirty chai, or freshly made smoothie. Dairy Queen & Geri’s Pizza (44475 State Route 821 S, Caldwell) – This long-time eatery offers Dairy Queen food (burgers, milkshakes) on one side and Geri’s Pizza on the other (pizza, breadsticks, frozen yogurt) within the same small restaurant. Also a jukebox. Popular spot for local sports teams to come for ice cream after games. Patty’s Place (46855 Marietta Road, Caldwell) – Casual restaurant offering American homestyle cooking and daily specials. Known for their peanut butter pie. I haven’t eaten here but has good reviews. Super Wok (18003 Woodsfield Road, Caldwell) – Casual Chinese restaurant that offers takeaway or eat in. If you are looking for Chinese (or really non-American food of any kind! ), this may hit the spot. Plus One Pizza (26 Olive Street, Caldwell) – Popular local pizza place serving pizza, wings, subs, stromboli and breadsticks. Can order by phone or online for pick-up or delivery. One of the few places in the area that does delivery. Wolf Run Drive-In Ice cream & Sandwich Shop (16417 Wolf Run Road, Caldwell) – This seasonal spot serves burgers, hot dogs, fries, snacks, and ice cream. They have over 35 flavors of milkshakes! Always stopped here as kids after a visit to Wolf Run Valley Park for ice cream. Golden Plaza (135 Main Street, Belle Valley) – A restaurant and dive bar serving American classics. Famous locally for its broasted chicken. Marianne’s Food Station (Main Street & Route 821, Belle Valley) – A small diner serving classic American diner dishes. Opens early so popular for coffee and breakfast. Cash only. R.J.’s Cafe (51812 Seneca Lake Rd, Sarahsville) – A diner, bar, gas station, and general store all in one! Serves all sorts of burgers, sandwiches, wraps, wings, fish dinners, and more. Also has a decent selection of beers. Be sure to check opening hours ahead of time as most are closed one day a week and a couple are seasonal. I’d also recommend reading the latest reviews. Note if you are looking for a more formal restaurant or for more variety, you’ll need to head to Marietta (~ 30 minute drive south) or Cambridge (~ 25 minute drive north). With a couple of notable exceptions, your accommodation options are primarily limited to chain motels and hotels in Caldwell. But you’ll also find a lovely B&B and rustic cabins. Most of the hotels were newly built in the past several years because of the oil boom in the area, and it is easy to find a good price for a stay in Caldwell to suit almost any budget. All lodging options in Caldwell offer free parking. 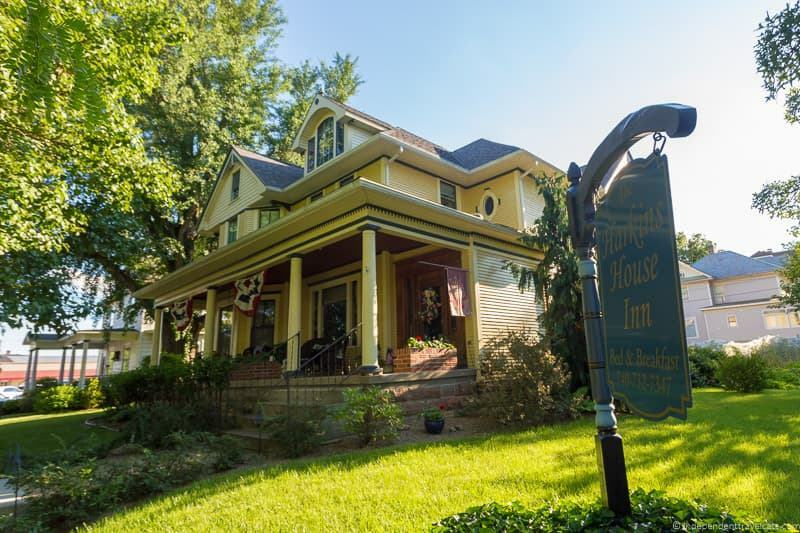 Harkins House Inn – A nice local bed and breakfast in historic home with friendly helpful hosts. Homecooked breakfast prepared each morning for guests. Our pick for a place to stay in Caldwell if looking for a non-chain spot. Days Inn & Suites – A 2-star hotel with a 24 hour front desk, wi-fi, and included breakfast. Microtel Inn & Suites – Offers all the standard hotel perks like free wi-fi, a fitness center, flat screen TVs, and included breakfast. All rooms have coffee makers, microwaves, and mini-fridges. Comfort Inn & Suites – The Comfort Inn has all the regular amenities plus a heated indoor pool and hot tub, a spa, and complimentary continental breakfast. Seneca Lake Park – If you plan to spend time at Seneca Lake, there are cabins and seasonal campsites available. The vacation cabins have two bedrooms, kitchens, and screened in porches. Perfect spot for outdoorsy types and those who want to RV or tent camp in summer. If you are planning to spend time at The Wilds, you can also spend the night there in one of the cabins or yurts. 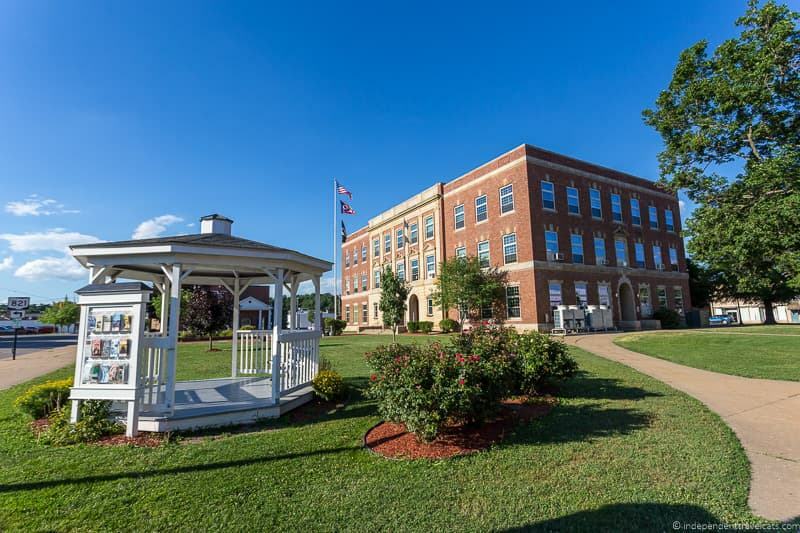 For more lodging options we recommend checking out lodging options offered in Marietta, which has many more options and a wider variety. 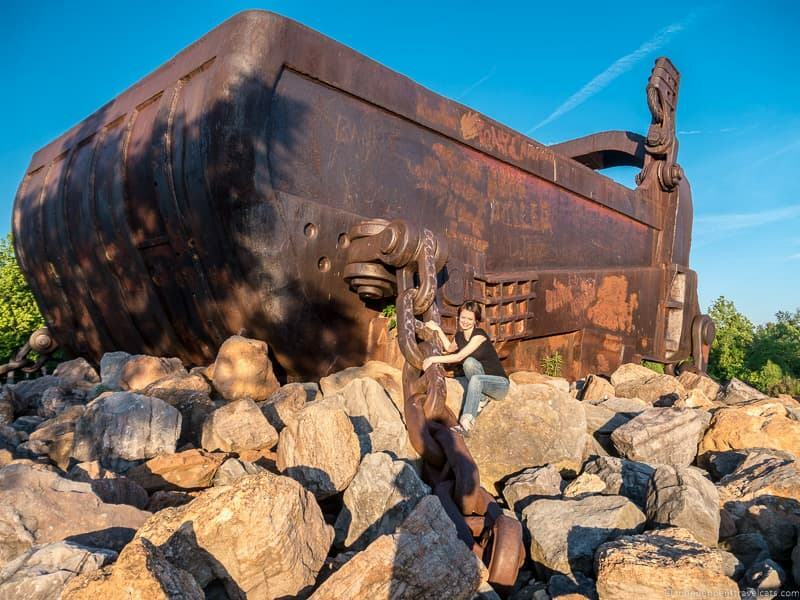 Many local attractions and restaurants do not have websites, but the best place to look up local information is the local tourism website run by the The Noble County Chamber of Commerce which has a good rundown of local attractions and events. If you are in town, the best way to get local information is to stop in at the Old Jail Museum, which is run by the Noble County Historical Society. The volunteers there should be able to give you some travel advice and they also sell books here on local history. If you are traveling throughout Ohio, we recommend also checking out the state tourism website which offers all kind of travel information. We also have articles on The Wilds, Ohio’s Amish Country, Sandusky Ohio & Cedar Point, and a guide to the waterfalls in Ohio. Note: When searching for information online, there are other towns named Caldwell in the U.S. and many search results for “Noble County” are for a county in Indiana (not Ohio) so be sure you are reading the correct information! 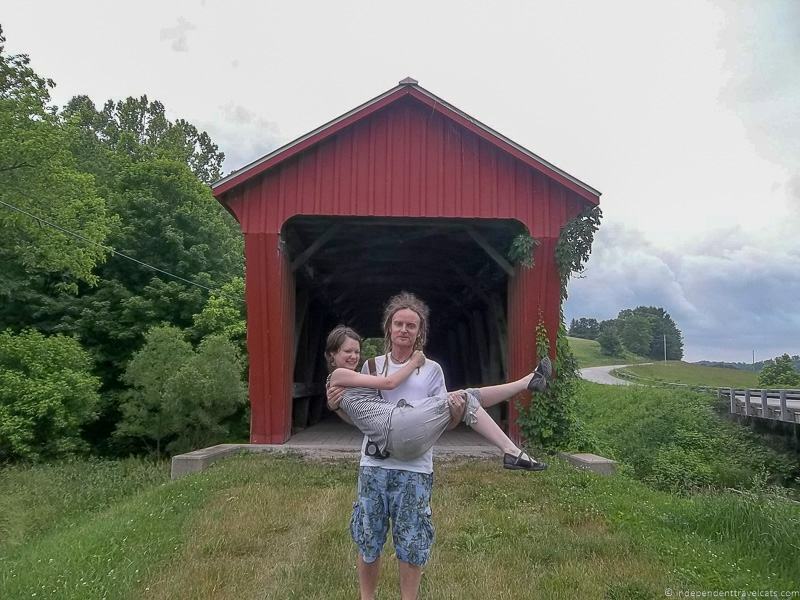 For a small county in rural Ohio, there is a surprising amount to do and see, and you can easily spend a few days exploring all the attractions, especially if you visit during a local festival. Most of the attractions take advantage of either the area’s history or its natural beauty and resources. The town square is the center of Caldwell and a great example of stereotypical small town America. It’s surrounded by local businesses, banks, and the Old Jail Museum (see below). Many of the town events and festivals like the Annual Fireman’s Festival and Art on the Square are held here. The centerpiece of the Square is the Noble County Courthouse. The current courthouse was completed in 1934 and designed by Charles J. Marr. On the third floor of the courthouse you’ll find four murals painted by local artist George K. Marquis which depict local historical events. 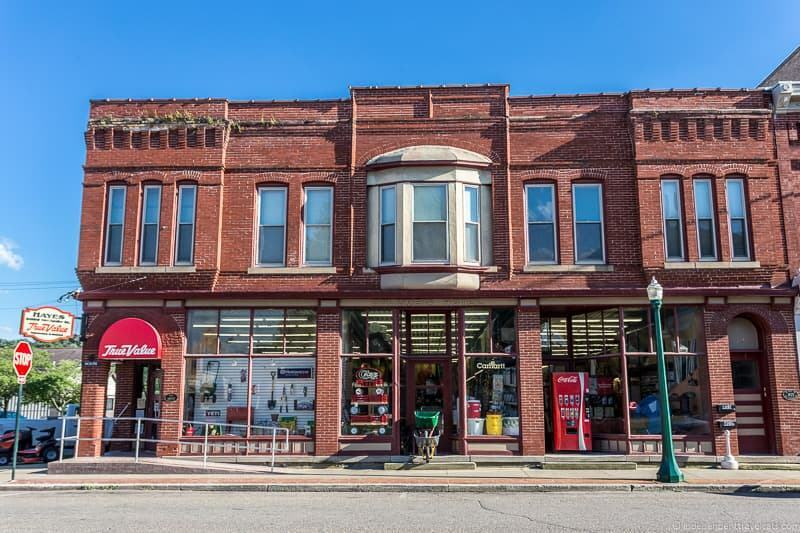 The Town Square is a good place to wander around and you can find local shops, including shops selling jewelry, crafts, antiques, shoes, hardware, and vintage clothing located on or just off the square. The Old Jail Museum, located on the town square, is housed in Caldwell’s former jail. It was built in 1882 and was one of few facilities that housed both the jailer’s home and the prisoners quarters under one roof. It is a late Victorian brick-and-sandstone 3-storey building. It was in use as jail until 1998. The jail was a bit like the one depicted on the TV series The Andy Griffith Show and former local sheriff, Landon T. Smith (who was the sheriff during my entire childhood) would have fit in well in Mayberry. If you want to know more about Smith’s experiences as the Noble County sheriff from 1973 to 2009, you can read his book (I think you can buy it at the Old Jail). Most of the crime in Noble County has largely been pretty minor but several high-profile cases have taken place including bank robberies and the case of serial killer Thomas Lee Dillon. Dillon pleaded guilty to five murders at the Noble County Courthouse. 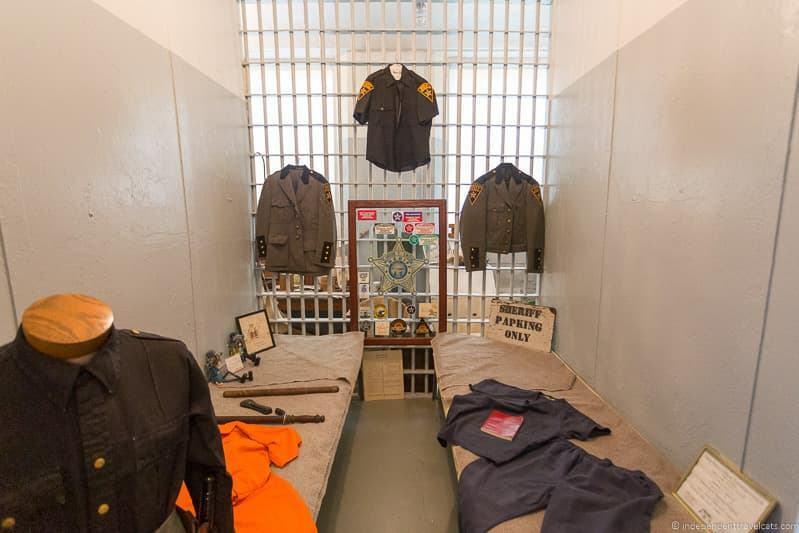 The jail is now run as a museum by the Noble County Historical Society. Displays tell you about the history of the jail and of Noble County in general. A number of exhibits focus on specific events or subjects such as the first settlers, U.S.S. Shenandoah disaster, Johnny Appleseed, and the World Wars. There are a number of artifacts that have been donated by local people and businesses to help tell the history of the area. This is a great spot to learn about the local history and to get more information about other places to visit in Noble County. Entry is by donation. 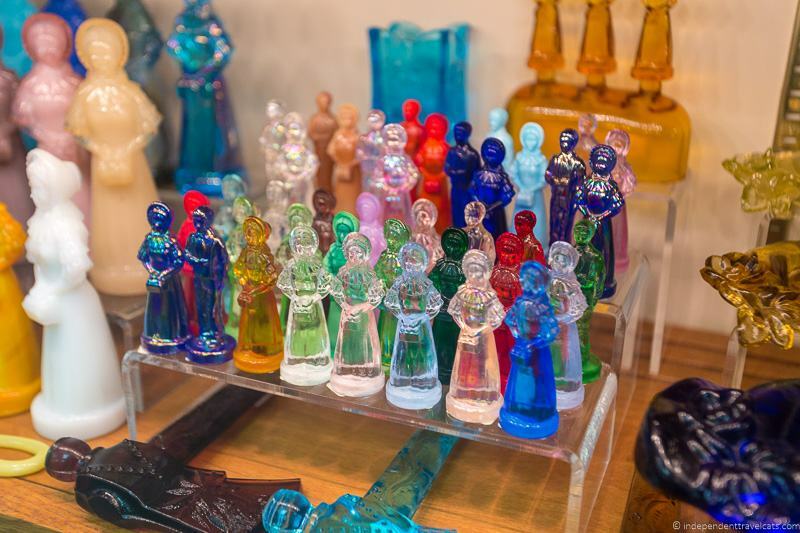 The Baker Family Museum contains one of the largest private collections of glass in the country with over 300,000 pieces. They have glass pieces from around the world with a particular focus on local glass companies like Fenton, Westmoreland, and Cambridge Glass. It’s really interesting to see the sheer size and scope of the glass on display. The museum has a lot more than just glass. It also contains a large collection of pottery as well as a large collection of antiques, which include a bit of everything from antique clocks to guns to cookware to old signs. Opening hours aren’t always set, so it’s best to call ahead (740-732-6410) to confirm the museum will be open during your visit. Admission to the Baker Glass Museum is free, but donations greatly appreciated. 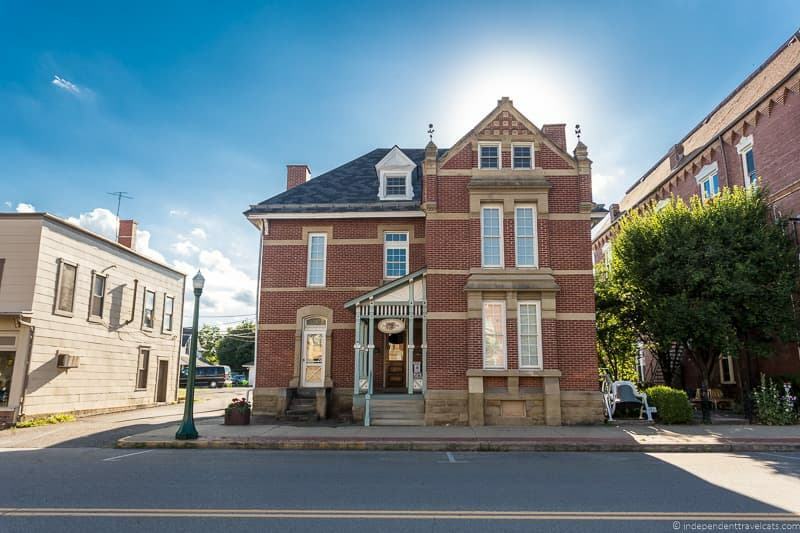 If a visit here sparks you interest in local glass we recommend heading to nearby Cambridge Ohio as well which is well-known to American glass collectors. There is the National Museum of Cambridge Glass and you can do a factory tour at Mosser Glass. The Ball-Caldwell House was built in 1832 and is the oldest house in Caldwell. It was built by Samuel Caldwell on the site of what is believed to have been a former Native American camp. The 9-room house is described as a “gentlemen farmer’s” house. There is also a large wooden barn nearby. The town of Caldwell was later named after Samuel Caldwell. He was a large landowner in the area and would donate the land to build the first Noble County Courthouse in 1854. The Caldwell house was purchased by the Ball family in 1920 from Samuel Caldwell’s granddaughter. 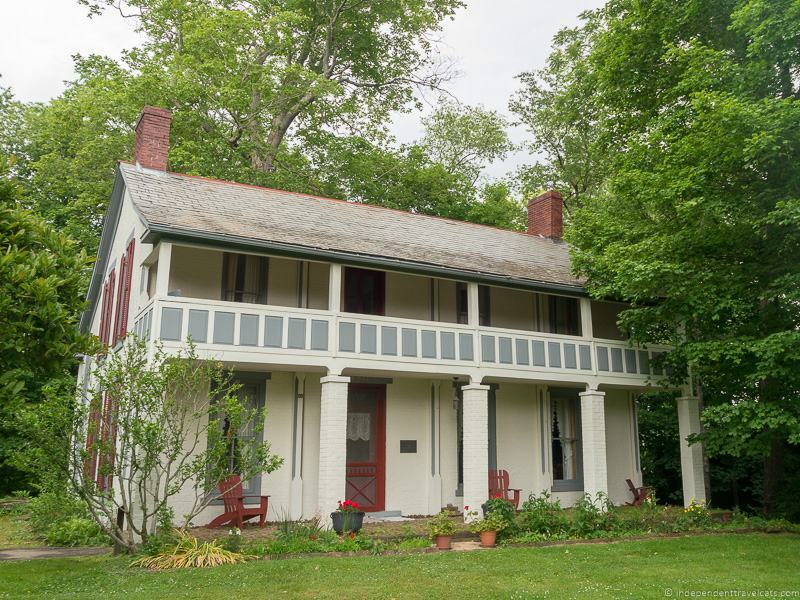 In 1980 the home was listed on the National Registry of Historic Places, and later in 2009 the Noble County Historical Society purchased the home from the Ball family. You can read much more about the history of the house and Caldwell family here. 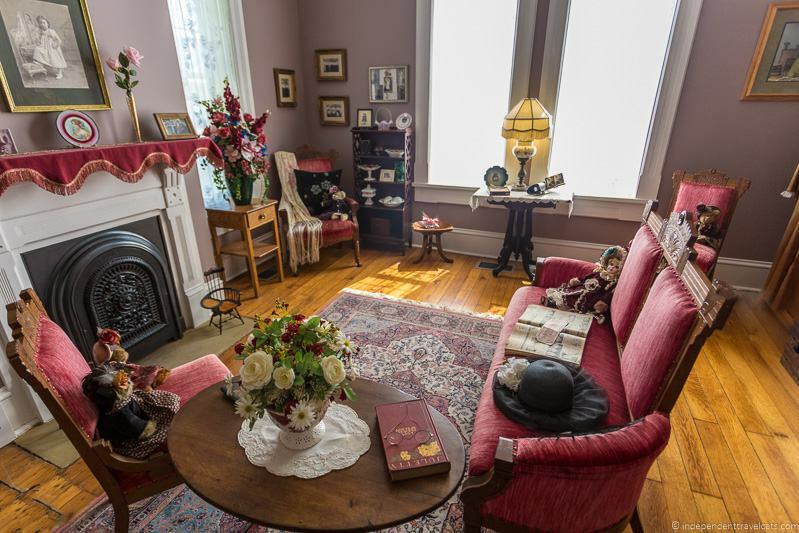 Many of the fixtures in the home are originals or reproduction of originals, and it has been furnished with an eclectic selection of local antiques. It’s a popular community event venue for weddings, receptions, and other events. The Caldwell-Ball House can be seen from the road but the interior is not regularly open to the public. But it is sometimes open during events, open houses, and sometimes guided tours are offered. If you are interested in visiting, I’d contact the Noble County Historical Society (Phone: 740-732-7715) to see if a tour can be arranged. The Big Muskie bucket is a pretty unique and amazing thing to see. It’s the centerpiece of Miner’s Memorial Park, located west of Caldwell. Ohio is located at the northern part of the Appalachian Coal Basin and southeastern Ohio has long been an important area for coal mining, and a lot of surface mining (a.k.a. strip mining) occurred in Noble County. The Big Muskie was the world’s largest earth moving machine and it was in use from 1969 to 1991. It was the only 4250-W Bucyrus-Erie dragline ever built and it could move 39 million tons of earth and rock an hour. It was named one of the Seven Engineering Wonders of the World! Big Muskie was shut down in 1991, and sadly the money could not be raised to preserve the entire machine. But the bucket remains as a reminder of the sheer scope and size of its former glory. It is really an amazing sight: the bucket alone weighs 460,000 pounds and has the volume of a 12 car garage. The local marching band can fit in it! The Big Muskie bucket is free to visit and there are panels and information located here explaining the history of mining in the area and facts about the Big Muskie. There is also the “Wall of Honor,” listing the names of employees of Central Ohio Coal Company, which was the company that operated the Big Muskie. A great place to visit after a visit to the Big Muskie is The Wilds. The Wilds was one of the areas of land that was heavily strip mined for coal by the Big Muskie. You can see photos of what it looked like before and after becoming a conservation area and safari park. 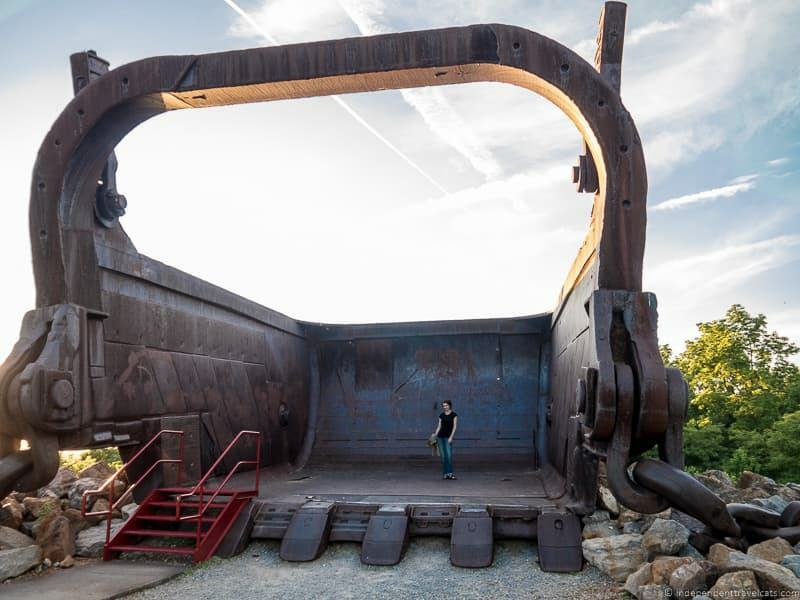 If you want to see a more intact Bucyrus-Erie electric shovel, the second largest machine of this kind, Big Brutus, has been preserved as a tourist attraction in West Mineral, Kansas. We took a detour from our Route 66 road trip to visit it a few years ago. Covered bridges were common throughout most of rural Ohio in the 19th and early 20th century. 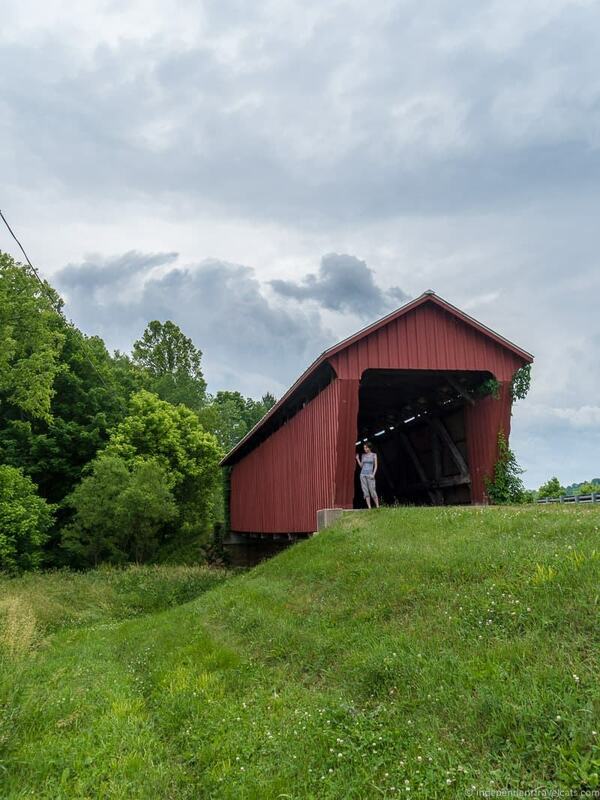 Noble County has three preserved covered bridges that you can visit. None are open to car traffic, but you can still visit them and walk across them. Park Hill / Rich Valley Bridge dates back to 1895 and is currently located in Heritage Park at Noble County Fairgrounds. It was originally two covered bridges (Park Hill and Rich Valley) that were combined in 1970 and relocated to Heritage Park. There is also a former 1880’s church, a 19th century one-room school house, and log cabin located here at Heritage Park. Parrish Bridge is located just off Country Road 8 / Rich Valley Road, over Olive Green Creek. It’s a 81 foot long multiple King Point Truss that was rebuilt in 1914 and painted bright red in 1964. It was restored in 2005. The Manchester Bridge also crosses Olive Green Creek just off Township Road 3. It was built in 1915 and restored in 2005. 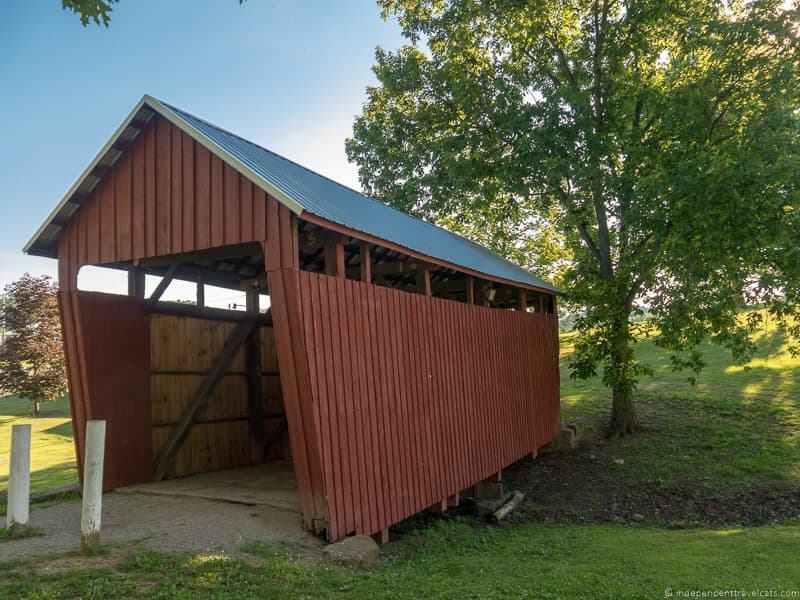 See the map at the end of the post if you need more help in locating the exact locations of the covered bridges in Noble County. 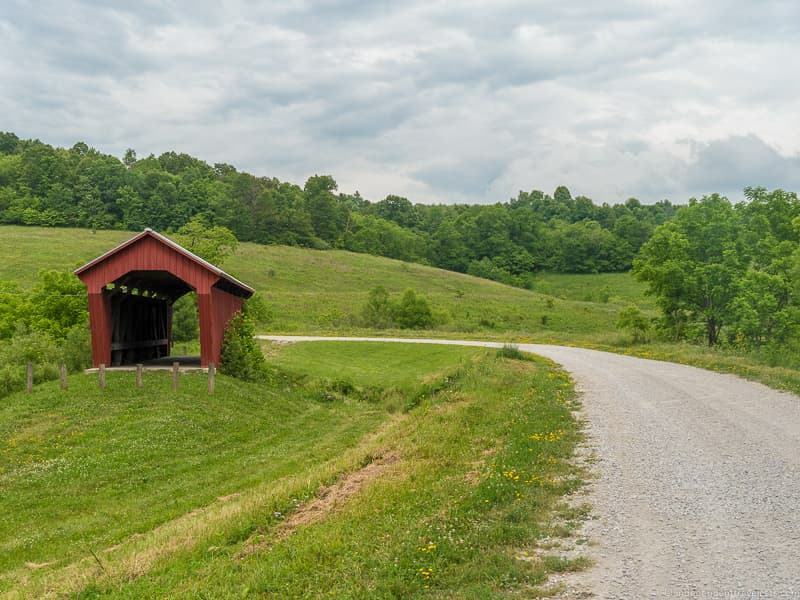 Covered bridge fans should also head to adjacent Washington County, where there are 9 well-preserved covered bridges. You can find more information on them here. If you are from the Midwest, you would have likely heard of Johnny Appleseed, a famous American pioneer and outdoorsman who is famous for planting apple trees across the Midwestern United States. If you are not from the Midwest, you may not be familiar with Johnny Appleseed whose real name was John Chapman. Chapman started a number of nurseries (primarily planting apple trees) and was also a Christian missionary who was known for his generosity, conservation, and love of animals. The popular image of Johnny Appleseed is that of an itinerant frontiersman wearing a tin pan as a hat, carrying a knapsack, and wildly sowing apple seeds all over the place. He is often shown being trailed by a collection of wild animals. Although Johnny Appleseed never lived in Noble County, his family owned a homestead in Noble County near what is today Dexter City. His father, Nathaniel Chapman settled here in 1804 with his second wife. Johnny Appleseed visited the area regularly to see his family. Johnny Appleseed died in 1845 and has been commemorated with a stone memorial in Dexter City. Members of the Chapman family, but not John Chapman, are buried nearby in a family cemetery on the hill above the memorial. 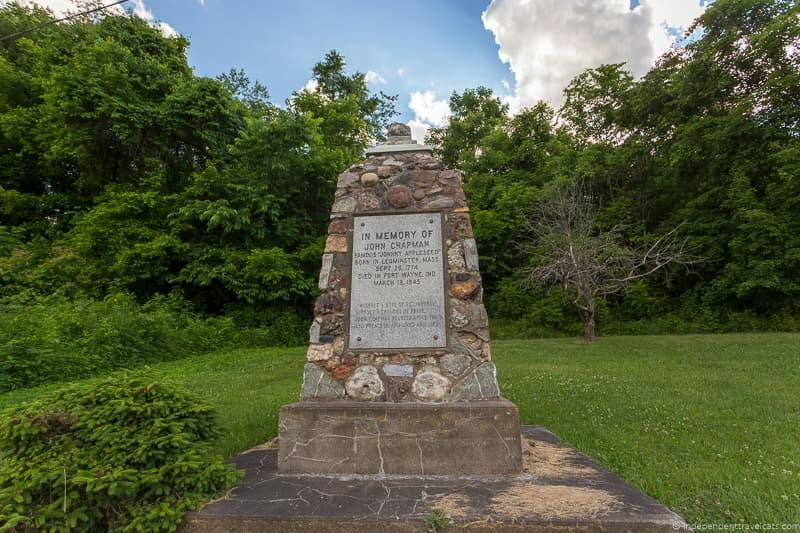 The small stone memorial is located at 38345 Marietta Road in Dexter City. There are two beautiful parks located in Noble County, which offer a range of outdoor recreational opportunities. Seneca Lake Park is a 4,000 acre park that features Seneca Lake (also called Senecaville Lake), Ohio’s third largest lake. The park has over 500 campsites, cabins, a swimming beach (with free wi-fi! ), amphitheater, and playground. 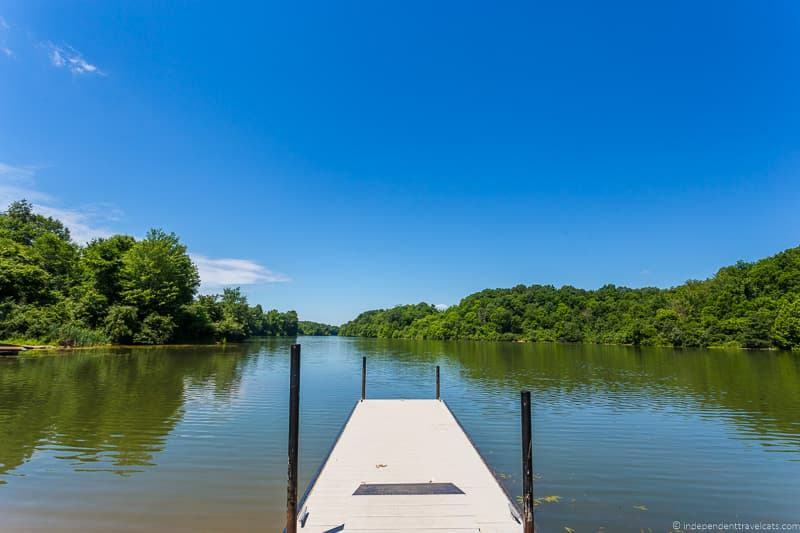 There are various hiking trails for exploring nature at Seneca, and opportunities for boating and fishing in the lake. For dinner you can pull your boat straight up to the Dockside restaurant. In the summer the park offers lots of educational and fun events, most notably, Movies on the Lake. Wolf Run State Park is a much smaller park with less amenities than Seneca Lake but it still has over 1,000 acres of parkland. 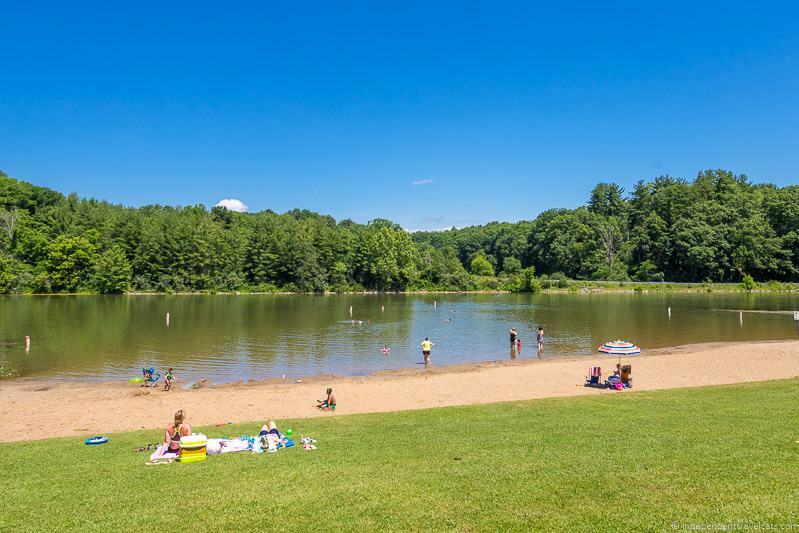 There is a 200 foot swimming beach and picnic area on the shore of Wolf Run Lake. There are three main hiking trails in the park. Over 100 campsites are available and most are open year-round. It’s also a great place to fish for bass, trout and catfish. In the winter months, sledding, cross-country skiing, and ice fishing are permitted. Hunting with a license is also permitted in some areas of the park. St. Mary’s Church of the Immaculate Conception is local Catholic Church. The brick Romanesque Revival building was built in 1875. The church was built to serve the existing Roman Catholic German settlers who had come here in the early 19th century. The community named the village Fulda after Fulda Germany. The area, and much of Ohio, has a large German ancestry, including my own family. If you have (or think you may have) local heritage here, check out this Fulda genealogy website. In 1980 the church was added to the National Register of Historic Places because of its significant place in local history. St. Mary’s Church is still an active Roman Catholic church and holds weekly services. The church is best known for its annual Labor Day picnic. 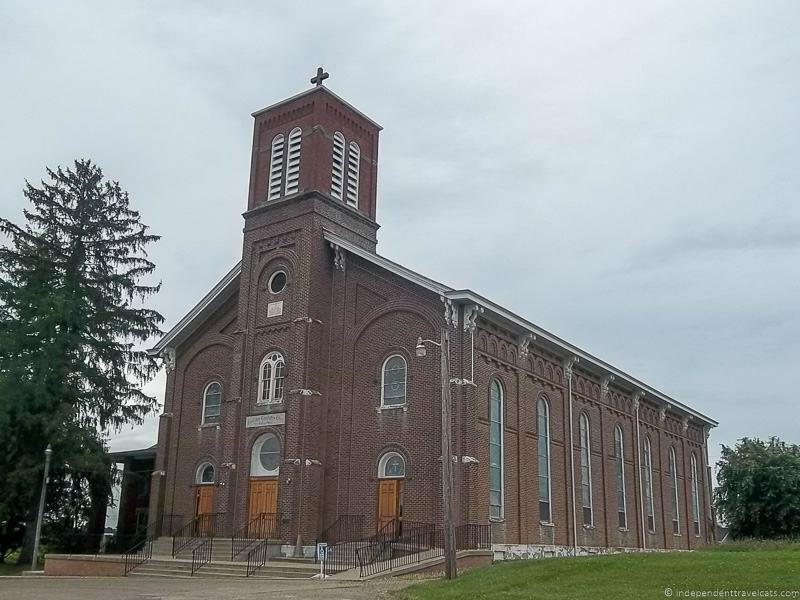 This is both a celebration and fundraiser for the church, but it also serves as an annual homecoming event for those with a German heritage and connection to Fulda. Events include meals, children’s games, bingo, square dancing, bake sale, and a raffle. Visitors are welcome to attend. 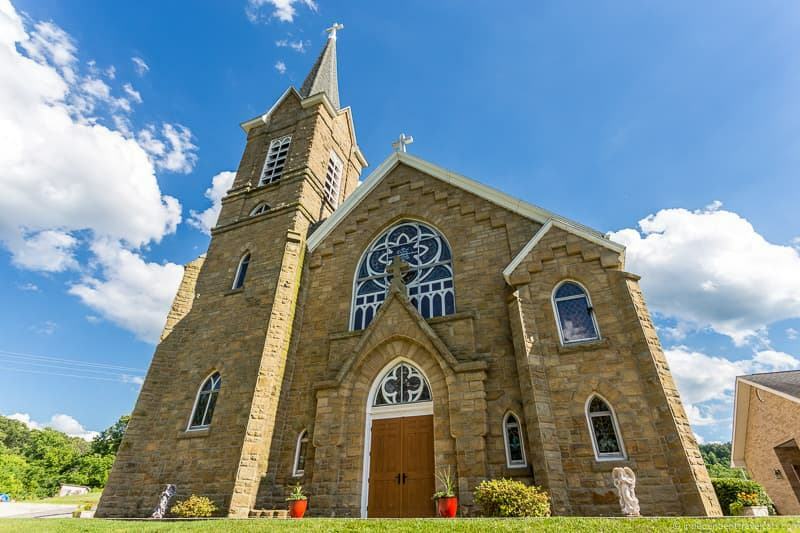 Similar to St. Mary’s, St. Henry’s Church in Harrietsville was built to serve the Roman Catholic German settlers that represented a sizeable number by the 1860’s. Previously the Catholics in the area had to wait for a visit from the priest at the Immaculate Conception Church in Fulda to attend mass or receive sacraments. The church was constructed in the 1890’s and was unusually built by German-born Chicago architect Adolphus Druiding rather than a local architect. Another unusual thing is that the church was built in the Gothic Revival style with a multi-storey tower and was built out of stone. At that time, there were no stone buildings in the area and it was unusual for a rural church. There was also a rectory built next to the church. In 1982 St. Henry’s Church was added to the National Register of Historic Places due to its historically significant architecture and importance in local religious history. The church is still active and has a weekly mass (be sure to check schedule in advance). The church also holds an annual church picnic on Mother’s Day each year, which is its most popular local event. Visitors are welcome. The USS Shenandoah was a 680 ft. rigid airship built for the U.S. Navy that was built for reconnaissance work. It was the first airship built for the U.S. Navy, the first rigid airship in the world filled with helium (rather than hydrogen), and in 1924 it became the first rigid airship to fly across North America (from New Jersey to California). The U.S.S. Shenandoah connection with Noble County, Ohio would come in September 1925. In September 2, the USS Shenandoah set off on a promotional flight from Lakehurst, NJ. On the morning of September 3, it encountered a thunderstorm in southeast Ohio and the airship was torn apart and crashed. It broke into three pieces directly over Caldwell, and the crash tragically killed 14 crew members. Amazingly 29 people survived the crash. The crash made national news although of course this was not the first or last airship disaster. The Shenandoah crash had a huge impact on the people of Noble County. To this day one of the local schools is named after the Shenandoah and their local sports team is The Zeps. The Visit Noble County website also has the contact information of some potential tour guides who can tell and show you more about the crash of the U.S.S. Shenandoah. 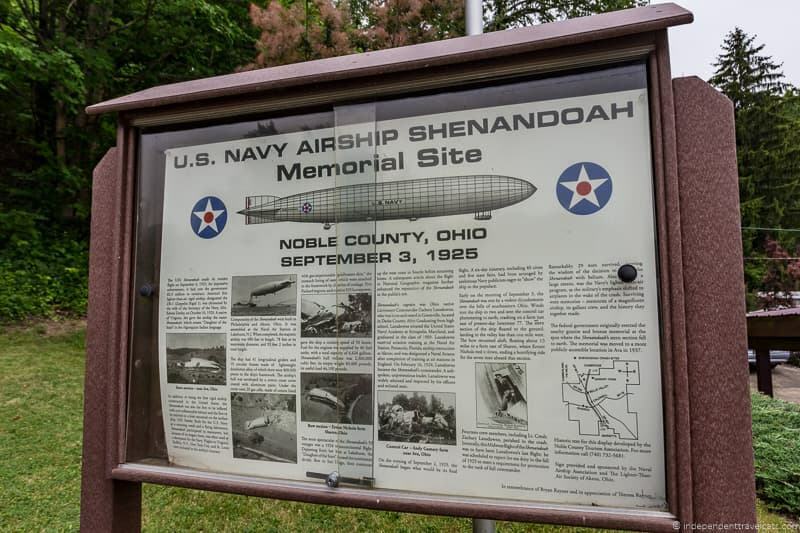 The Shenandoah Airship Disaster Museum is a small mobile museum that teaches people about the U.S.S. Shenandoah and its crash, and has preserved some of the artifacts from the crash. This includes a few pieces of the wreckage. 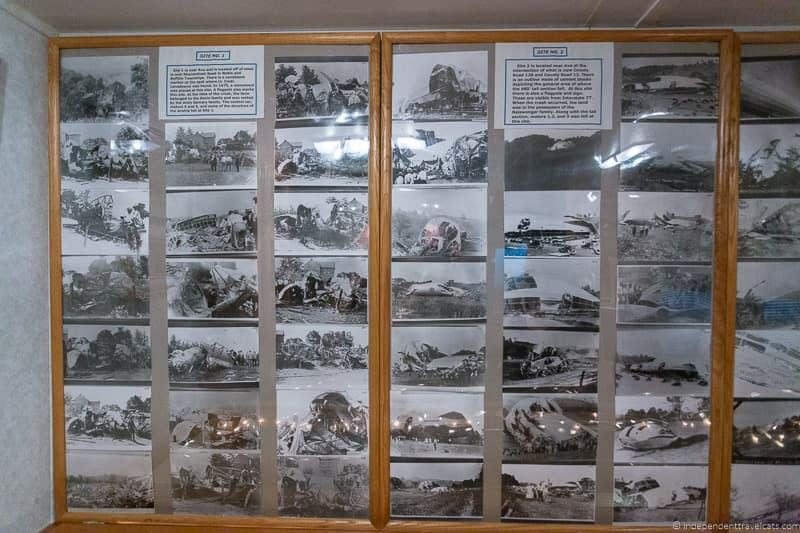 The mobile museum is run by the Rayner family, currently Theresa Rayner, and if you are interested in seeing it you can contact her to set up a time to visit (740-732-2740 or 740-581-2627). It is free to visit although donations are appreciated. At Thorla-McKee Park, east of Caldwell, you can find what is believed to be the first oil well in North America. It was dug in 1814 by Silas Thorla and Robert McKee while they were searching for a salt deposit. They found oil instead. Unfortunately for Thorla and McKee, oil wasn’t terribly useful in 1814, and they considered it more of a nuisance than a boon. They bottled the oil and sold it as a digestive elixir called Seneca Oil, (sounds disgusting!) but never saw the true potential of their discovery. The park is very small and there isn’t too much else here. There is the well and the original sycamore log used to case it. 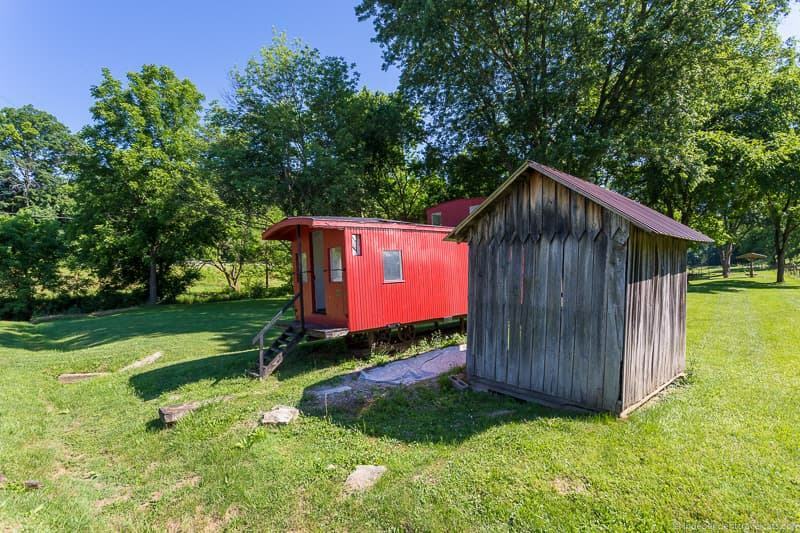 There is a plaque and some signs about the well, an old Ohio River & Western train caboose, and a replica of the OR&W train station at Brister. 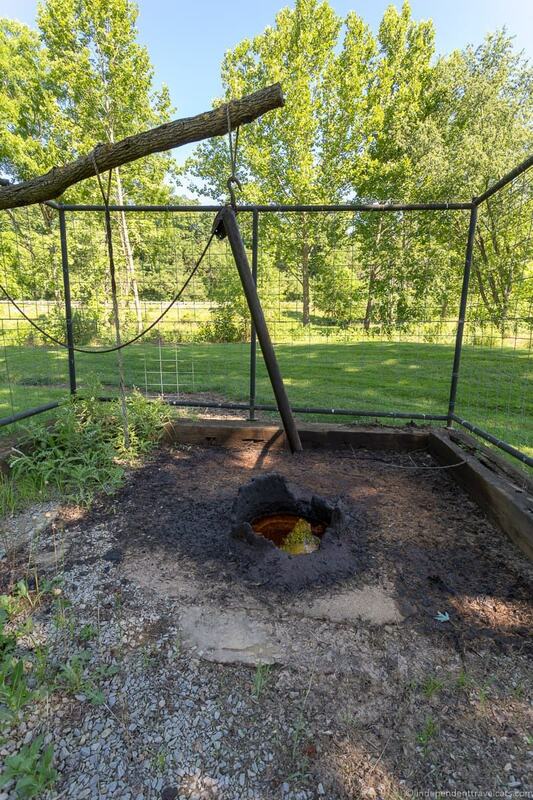 Although the well is not too much to look at, it is interesting that this is the first place that oil was found in the country, although it would not be until 1859 that the first commercial oil well (Drake Well) was dug in Pennsylvania. The first well in Ohio would also be drilled in 1859 and by the end of the 19th century, Ohio (not Texas or Oklahoma) would become the largest producer of crude oil in the United States for several years! The local oil and natural gas industry would experience a number of booms and busts over the decades. In the last decade, there has been another oil boom in southeastern Ohio, and so the story continues. John Gray was one of the last surviving American veterans of the Revolutionary War. Gray was actually born in Mount Vernon Virginia, near the home of future president George Washington. Gray joined the Army in 1760 at age 16 and fought in the Battle of Yorktown. Later after the war, he moved to the Northwest Territory and settled down in Noble County. He died at age 104 in 1868, living through both the American Revolutionary War and the Civil War. He died at the home of his daughter, Nancy McElroy, and is buried in the McElroy Family Cemetery at Hiramsburg. 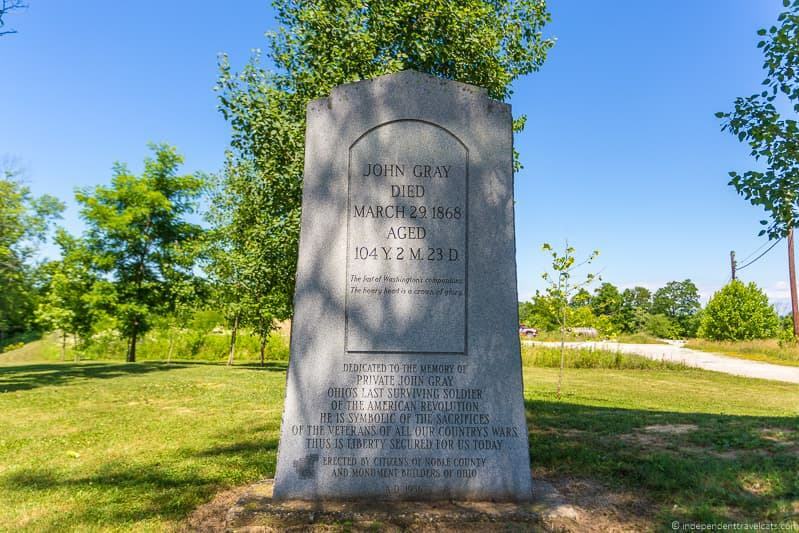 A stone memorial to John Gray was erected in 1956, and is located at a small roadside park on SR 821 between Belle Valley and Caldwell. If you like outdoor activities, there are lots of things you can do in Noble County and the surrounding area. These including hiking, boating, cycling, fishing, hunting, ATVing, horseback riding, mountain biking, camping, and more. First of course, you have the previously discussed Seneca Lake Park and Wolf Run State Park. Both of which offer swimming, boating, fishing, hiking, camping, and other activities. In addition to the two major parks there are 58,800-acres of recreational land in Southeastern Ohio furnished by American Electric Power. There are spots for camping, horseback riding, mountain biking, hiking and more. You can hunt or fish as well, although you will need to obtain a state license first. The 1,400 mile Buckeye Trail runs the length of Ohio and passes through the region. You can follow some of the Blue Blazes trails for a long or short hike. There are trail heads at Wolf Run State Park, at Caldwell Lake, and near the USS Shenandoah Crash Site. Although only a small part of the Wayne National Forest falls in Noble County, it is a great place to consider as it offers over 300 miles of trails for hiking as well as trails for all-terrain vehicle riding, mountain biking, and horseback riding. Wayne National Forest covers over a quarter million acres of the Appalachian foothills of southeastern Ohio. Note that for some activities, like fishing and hunting, you’ll need a license. You can purchase these licenses online and find all kids of legal regulation and safety information on the Ohio Department of Natural Resources website. The Wilds is not technically in Noble County, but it’s not far away in neighboring Muskingum County. It is the biggest attraction in the area, figuratively and literally, as it sits on 10,000 acres of land. It is one of the largest conservation centers in North America, and was developed on land that was formerly strip mined for coal. The biggest draw for tourists at The Wilds is definitely the safari park, which opened to the public in 1994. It includes a number of animals from around the world including camels, cheetahs, zebras, giraffes, antelope, rhino, and ostriches. The park offers regular safari tours in open-air safari buses that allow visitors to see many of the animals within the large enclosures. The Wilds also offer all sorts of activities including horseback riding, ziplining, and fishing. You can also stay overnight in a cabin or yurt. It is also a great place to see local wildlife species and a popular local birding site. The non-profit site is used for a number of conservation projects and research studies across a variety of disciplines and subjects. You can read more about our visits to The Wilds in my post on The Wilds Animal Park which should provide you with the all information you need to plan your own trip. There are several larger local festivals and events that take place in Caldwell each year. If you plan your visit around one of these events you are sure to have a good time and experience an authentic slice of small town life. 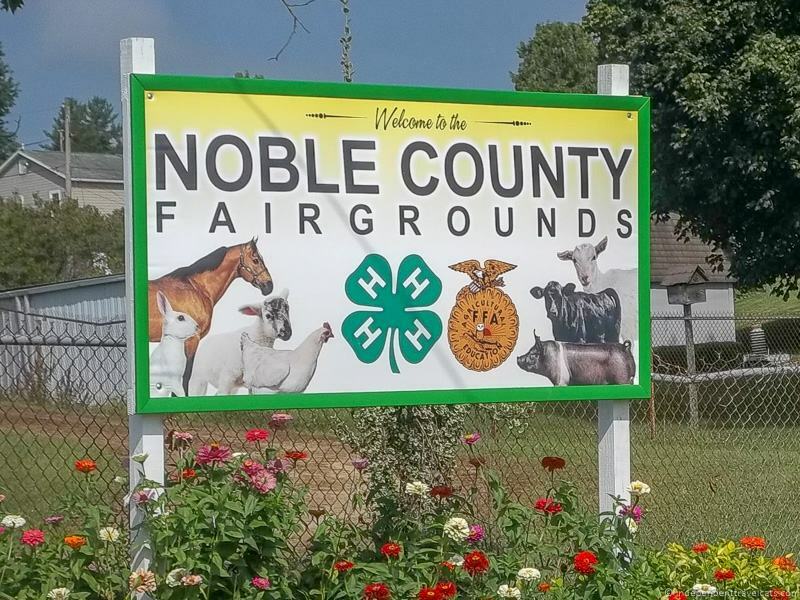 The biggest event in Caldwell each year is the Noble County Fair each August. This has been organized each year by the Noble County Agricultural Society since 1852. It lasts for a week. In addition to all the normal American county fair attractions like rides, carnival games, livestock, crafts, and fried food, there are nightly music events, truck and tractor pulls, and a demolition derby. If you are not familiar with demolition derbies, it is a motorsport where driver’s deliberately crash their cars in battle; the last car standing wins. It’s very entertaining! The second biggest event of the year is the Annual Fireman’s Festival in late July. It is a 3-day fundraising event hosted by the Caldwell Volunteer Fire Company. There are carnival rides, food, fun runs, raffles, car shows, games, music, and parades. 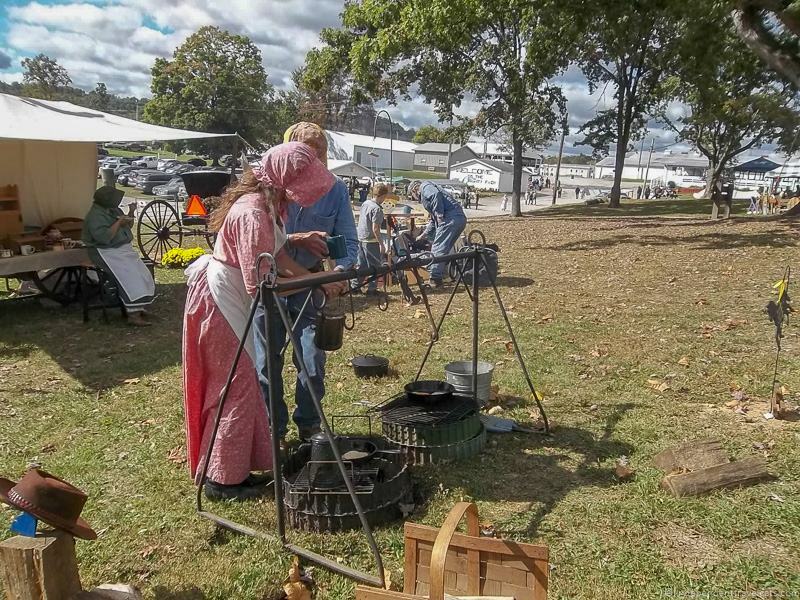 The Soakum Festival is a pioneer days type event at Heritage Park. Locals dress in period costume and there are historical demonstrations (crafts, butter churning, blacksmithing), talks, and food. The 19th century one-room school, church, and log cabin are also open to the public during the festival. It normally takes place in September. Art on the Square is an annual local art and craft show, usually held in June. It’s a great time to find heirloom quality handmade quilts, local crafts, furniture, and artwork. There’s also food, live music, face painting and lots of stuff for the kids. In addition to the larger events, there are many church, school, and charity events throughout the year. There are also sporting events throughout the year and the high school football games are a great place to join the locals, local teams are the Caldwell Redskins and Shenandoah Zeps. If you are looking for something specific, you can check the local newspapers (The Journal), listen to the local radio, or ask around about any local events during your visit. Enjoy the slower pace of life of a small town and rural county. There is little hustle and bustle here and you can enjoy the rhythms of small town life, find a deserted hiking path, start a chat with some locals, take a scenic drive, stay up stargazing, or hideaway in a cabin by a lake. This is a great place to recharge, read a good book, and relax. 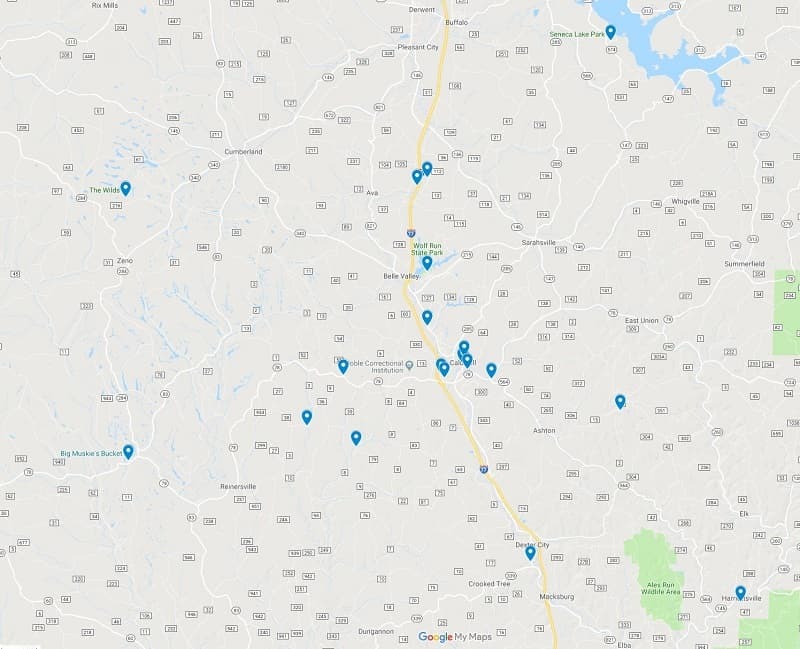 Some of these locations, like the covered bridges and Shenandoah memorial locations, don’t have specific street addresses, so we’ve made a Google Map for anyone needing help finding these locations. This includes all the above Caldwell and Noble County attractions mentioned above in the article. Below is a map of the Noble County attractions. You can click here or click on the map photo below to see or interact with the detailed map. Well that is our guide to visiting Caldwell and things to do in Noble County. 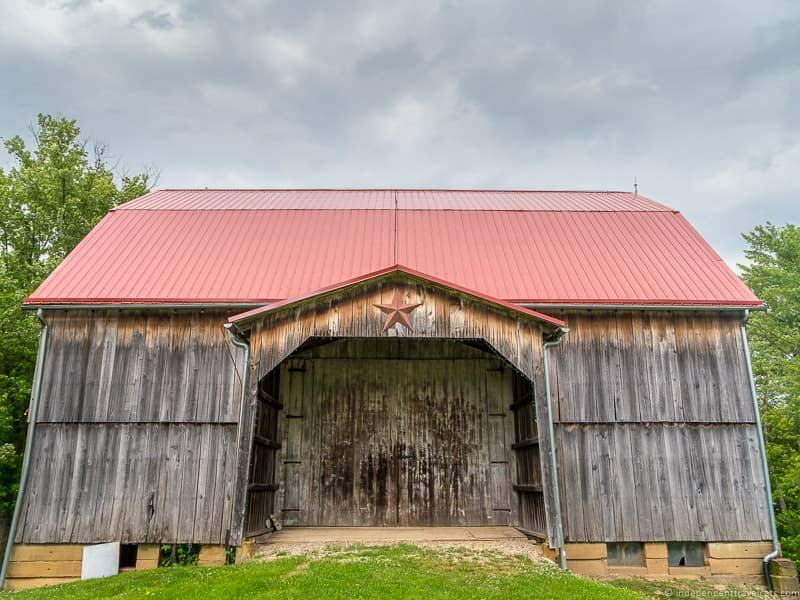 Hopefully we’ve shown not only what there is to do in this part of Ohio but also that there are plenty of things to do in just about any place if you take the time to scratch the surface. I hope you’ve enjoyed getting to know my hometown! Have you ever been to Caldwell, or would you consider a visit? If you are a local, feel free to share your favorite things to do in Noble County. If you have any questions on visiting Caldwell or Noble County Ohio, or what to do there, please let me know in the comments! Noble County looks like the perfect place to build your vacation house, seriously. It looks so dainty and peaceful! The photos made me want to go here, Laurence and Jessica. Your hometown is really beautiful. I’m curious to know what made you head to Caldwell in the first place. I’ve never been there, but my mother grew up in Shadyside, OH, which is only about an hour away, so the scene is very familiar. I love the people and history of this region, and have enjoyed many fireman’s festivals over the years. Always a beautiful place to visit.